Get your Miele Refrigerator Repaired Today. Invite a certified technician to repair your Miele fridge and join thousands of happy customers around the San Francisco bay area including Marin, San Mateo, Alameda and Contra Costa Counties. The technicians at The Appliance Repair Doctor are fully licensed and experienced with all models of Miele appliances. Available 7 days a week, on evenings, weekends and Holidays, our technicians work with your schedule and are located around the corner, wherever you are in the San Francisco Bay Area. All of our technicians are licensed by the State of California to do repairs on all appliances. They all receive comprehensive training so that you get the best possible service. We are Fully Insured so you can have peace of mind when you use us for your Refrigerator Repairs! We had just moved in to a new rental but the ice maker in the refrigerator was broken. Elior was the repair guy; he came on time and was very friendly!!! Turned out that the part needed to be replaced, but luckily he already had the part with him and was able to change it out and get in working within an hour. I will call and request him again if we need other repairs. Ron has just leave the house and done a great job in my refrigerator. Its a very polite and technician, tells you the problem and all possibilities. Also he fixed my refrigarator with no mess at all, care about leaving thinhs organize and clean! Thank you The Appliance Repair Doctor! I was desperate when my refrigerator went out, this weekend. Luckily, you guys were there when I needed you! Eli was friendly, efficient, professional and reasonable. What more can one ask for? l recommend your business to family, friends and all! I am extremly pleased with the repair work that Elior did on my refrigerator today. He is friendly, honest and very helpful and my refrigerator is running well again. He's a five star man! I recommend him highly. The German company, Miele, is a manufacturer of high-quality domestic and commercial appliances, including refrigerators. Their refrigerators are known for versatility, convenience and the ability to keep food fresh and healthy longer. A ventilator provides for a uniform temperature by evenly distributing cold air throughout the unit. The appliance can be installed in various combinations, with freezer and fridge side-by-side, one unit over the other or as an under counter unit among other configurations. The Miele PerfectFresh feature allows the storage of fruit and vegetables at the perfect temperature to preserve them for up to three times as long as usual. Even premium brands, however, sometimes need repairs. Some of the more common repairs required for Miele refrigerators are given below. If power is reaching the appliance there are a number of other possible reasons the refrigerator no longer runs. A circuit may have blown. The door switch may be falsely reading an open door. An accumulation of dust or lint may coat the condenser coils. If the coils haven’t been properly cleaned for a long time the condenser may have burnt out. Of course, there may be still other causes. A dust-encased condenser coils may cause the strange noises or the refrigerator motor might be constantly running in an attempt to keep the interior cool. If the coils are clean the problem might be with the insulation. These may be the start of problems with the internal workings of the refrigerator. Dirty condenser coils can lead to many serious problems such as the condenser burning out. To the cost of replacing it will be added that of the food lost through spoilage, which can be significant. Condensation causes moisture to form on the outside of the refrigerator. The fridge’s cool air draws moisture from the warmer air surrounding it. It can be caused by damaged or worn gaskets around the door or perhaps the temperature is set too cold. Dirty condenser coils or internal malfunctions within the refrigerator can also be the problem. A leak underneath the appliance is often due to food particles or ice blocking the defrost drain. Water can also leak from a cracked drain pan. Water lines running to the ice maker sometimes crack. Plastic hoses tear, crack, or become kinked. Sometimes connections to the lines wear out. In any case, the problem should be taken care of at once. As with all symptoms, there are a variety of possible causes. Loss of cooling can be attributed to many causes: One of several of the unit’s fans may not be working. A sealed system component, either the compressor, evaporator or condenser may be at fault. Other causes may be faulty defrost timers, relays or fan motors. Many of the problems listed above can be expensive if not addressed immediately. Miele recommends that you call only a technician that is trained and certified to work on Miele refrigerators. Fortunately, The Appliance Doctor (http://www.appliancerepairdoctor.com/) has technicians with experience on all models of Miele appliances. Their service area covers the San Francisco Bay area. They provide same day service at no extra cost even in evenings, on weekends and holidays; free service calls with repair and a full warranty on service and repairs. Put your Miele fridge in safe hands with The Appliance Repair Doctor! Available in the San Francisco area and more. Call us at (415) 484-1000 for same day, warrantied repair. You can also book online using the form to your right and we will get back to you in five minutes! Miele is a top brand recognized for it’s high-end build and amazing features. It promises long-term, durable use. However, even the best of the best can hit bumps along the way, so it is important to have a reliable source of fridge repairs at your disposal. Don’t let a broken down fridge stress you out! The Appliance Repair Doctor puts your top of the line Miele fridge in safe hands with extremely qualified and trained technicians. Even better? All repairs also receive a warranty. Receive same-day service today! The Appliance Repair Doctor can repair all models made by Miele, including the single door refrigerator, single door freezer, bottom mount fridge freezer, and wine storage system. No ice, too little, or too much in the ice maker. Fridge and freezer temperature too high or too low. Leaks and drips in the fridge or freezer compartment. Malfunctioning water dispenser, such as floods or insufficient water being produced. These and all other problems will be quickly resolved by our professional repair technicians, simply call (415) 484-1000 or book your appointment online by clicking here! Same day service to get your household back on track! Miele has been family owned and run since 1899, and their quality and care in the products they produced has never diminished. Their ability to make quality, long-term appliances is one of the many reasons they have been highly regarded as one of the top kitchen appliance brands out there. Removable shelves that make cleaning a breeze. Stainless steel for simple cleaning and cutting edge design. AirClean filters that help odour control. Doors that open and close smoothly and easily. A++ energy star rating, saving you money and helping the environment! Wide selection in storage and compartments, making organization easy and customizable. Your Miele fridge is in knowledgeable, safe hands, and we are confident in that claim! If you experience the same problem after your Miele fridge repair, you will rest easy knowing that The Appliance Doctor offers a full 90 day warranty. Any addition part used in repair will be insured by warranty from the manufacturer for 1 year! The Appliance Repair Doctor is here to serve you 7 days a week, 365 days a year. We are even here during evenings, weekends, and holidays, all for your convenience! Our emergency hours are 5am-11pm daily. Miele offers a variety of fridges for your your kitchen. Miele is a high end brand that has been making fridges since 1899, so you know you are purchasing from experts. The stainless steel design of this fridges makes for simple cleaning and a beautiful design! If your Miele single door fridge is ever in need of a repair, call the Miele experts at The Appliance Repair Doctor for a same day repair. 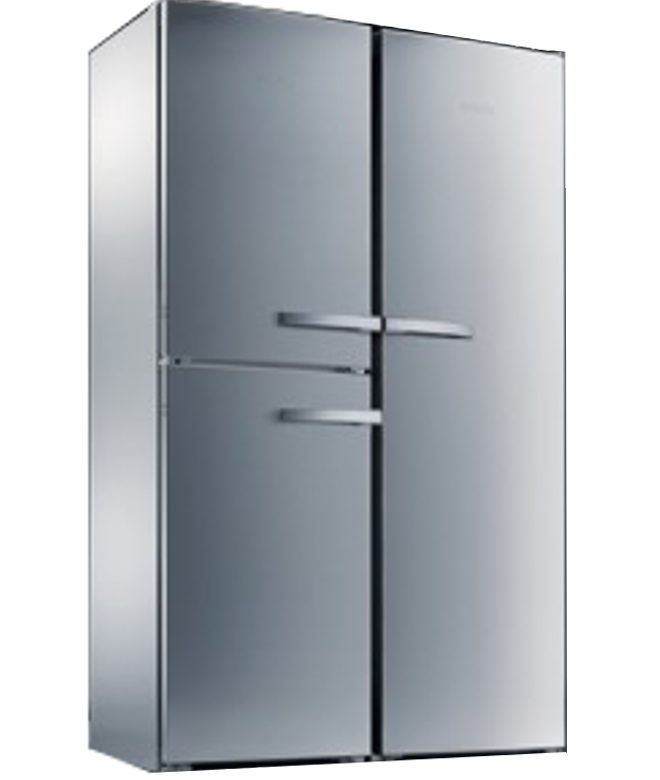 Spanning from 18” to 36” the Miele MasterCool single door freezers are a great addition for any home. These freezer doors can be built in, are left hinged have an automatic ice maker and water dispenser. The freezer comes equipped with BrilliantLight, halogen interior lights distributing lights evenly through each level. Contact the Appliance Repair Doctor if your Miele single door freezer needs repair! When you don’t have space in your home for a double door fridge and freezer unit, Miele has a bottom mounted freezer option. The combination units offer lots of storage space! Features of the bottom freezer include Frost Free, and ice maker, full access drawers and SoftClose doors. If your Miele Bottom Freezer needs repair, call the doctor! San Francisco is the heart of the Bay Area with its colorful culture and flourishing communities. Miele fridges can be found all over the city from small coffee shops, to residential houses and large corporatons. When you need a repair for your Miele fridge, give the Appliance Doctor a call! With over 7 million people in the Bay Area, Miele fridges can be found in all the cities and counties. With Miele fridge reliability, your fridge should run smoothly for its entire life. If unfortunately, you do require some service or maintenance, give the doctors a call! Located in the South Bay, Marin County is the biggest city in the Bay Area. Marin County’s population is growing rapidly due to the increasing numbers of people being employed in Silicon Valley. With their busy schedules, the Appliance Repair Doctors can do Miele fridge repairs at your convenience! Even during evenings and weekends. Give the Doctors a call! Located in the east bay, Oakland is the largest city in Alameda county. Miele fridges can be found in homes across Alameda county. In case you need service there is always a doctor in the area. Call the appliance repair doctors today and ask about our same day service. The East Bay Area covers Alameda County. Some of the major cities in The East Bay include Oakland, Fremont, Hayward and Alameda. With the growing population in this area, The Appliance Repair Doctor has hired a new technician who is dedicated to servicing the East Bay. If your Miele fridge breaks down, you know who to call. Contact the Doctors today! The West Bay Area & Peninsula covers San Francisco and San Mateo Countiy. Miele fridges can be found in large quantities across many cities in the West Bay Area. The Appliance Repair Doctor has Doctor servicing this area full time to ensure your Miele fridge stays running. Call today or book an appointment online today. The South Bay Area includes Santa Clara County, with the largest city being Marin County. Here is the home of Silicon Valley, headquarters for many major tech companies in the United States. We understand that life can be hectic and you can be strapped for time. That’s why there is always a Doctor around when you need it most. If your Miele fridge ever lets you down, call the Doctors today for a quick and immediate rescue! San Mateo County, just south of the city of San Francisco, our doctors are ready to provide service in cities including, Atherton, Belmont, Brisbane, Burlingame, Daly City, East Palo Alto, Foster City, Hillsborough, Menlo Park, Millbrae, Redwood City, San Bruno, San Carlos, San Mateo, Woodside and more! If you ever have a problem with your Miele fridge, give the Doctors a call! In Alameda County, located just east of San Francisco, the Doctors are ready to provide Miele fridge repairs in cities such as, Oakland, Alameda, Albany, Berkeley, Dublin, Emeryville, Fremont, Hayward, Newark, Piedmont, Pleasanton, San Leandro, Union City and more! Santa Clara County, located at the South Bay, our Appliance Repair Doctors can provide same day service for your Miele fridges in cities such as, Marin County, Campbell, Cupertino, Gilroy, Los Altos, Los Altos Hills, Los Gatos, Milpetas, Monte Sereno, Morgan Hill, Mountain View, Palo Alto, Santa Clara, Saratoga, Sunnyvale and more! Call for an appointment today! Marin County, just north of San Francisco, The Appliance Repair Doctor is at your service for your Miele fridge repair needs in Belvedere, Corte Madera, Fairfax, Larkspur, Mill Valley, Novato, Ross, San Anselmo, San Rafael, Sausalito, Tiburon and more! Call us to book a service call! Contra Costa County is located in the East Bay Area, just east of Alameda County. The Appliance Repair Doctor is ready to serve you and provide same day service for your Miele fridge in cities all over the county including, Richmond, Concord, Walnut Creek, Pleasant Hill, Martinez and more! Call us today to book your same day service call!